I got to chat with the Third Floor Gamers via Skype today. It's a school-based group of nice kids just getting into gaming. Somehow, their fearless leader, Michael, stumbled onto my game and bought a stack of them for the club. He also did a cool video review on BGG. They seem to enjoy playing Revolution!--one of them had just scored over 350. Nice! Unfortunately, they couldn't hear me too well on their end, so I ended up having to do a lot of chat typing. I would have liked to say more but it was still fun. Some playtesting might be in their future . . . Thanks, guys! 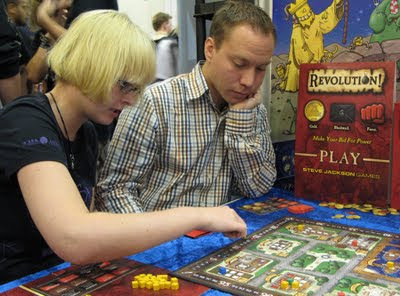 Unfortunately, the the Essen buzz for Revolution! is only an imperceptible whisper. This picture is the first documented evidence that it was even there. These nice Germans seem to be moderately amused. I understand that there is a lot of competition for people's attention there--lots of games everywhere. The ratings seem to be coming at a steady pace on BGG. Meanwhile, I've been working several other prototypes, getting them in front of publishers, testing others and making new ones. Once something breaks loose, I'll be sure to let you in on it. I checked my stats today and noticed that HUNDREDS of people visited my blog in the last few days because of a Google image search. The coveted image? 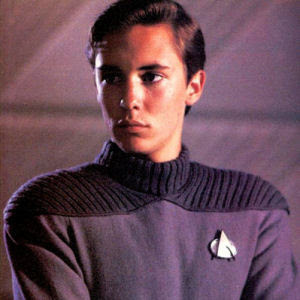 Wil Wheaton of Star Trek. That's right--if you're looking for ONE picture of this fine actor, you've come to the right place! While you're here, how about checking out Revolution!? You just searched for Wil Wheaton, so I know you're a geek--and geeks love my new board game (Wil sure does)! BTW, if you're not a geek, my sincerest apologies (just between us, Revolution! is really more for cool people anyway). Anyway, thanks for stopping by and artificially inflating my blog hits! Wil Wheaton, of Star Trek fame, mentioned his upcoming trip to RinCon in Tucson, AZ, where he looks forward to playing Revolution!, among a few other games. I am currently experiencing a level of geekiness beyond all imagination. Now if I can just get Worf to try it out . . . I'm sure he would say something like, "MajQa'!"